The new Le Chéile Unit at Edenmore National School is providing a fantastic and badly needed service to children and their families from the area. Megan McCarron and Áine Treanor decided to run the Mini Marathon recently and they gathered some sponsorship for the event. 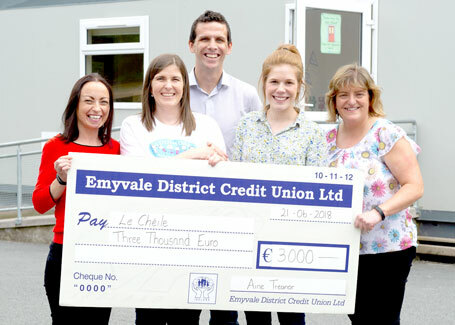 Last week they handed over the proceeds at the Unit and the total amounted to €2,025. The school was delighted with the donation and assured them that it would be well spent. Congratulations to Megan and Áine for completing the challenge and raised such a good sum for the Unit. At the presentation were: Barry Cuddy, Principal;Áine Treanor; Edel McGrath; Megan McCarron and Bernie O'Neill. 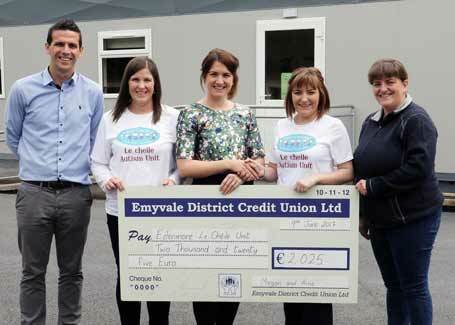 Áíne Treanor, 2nd from left, is pictured making the presentation of a cheque for €3,000 to some of the representatives of the Le Chéile Class at Edenmore National School. The money was raised by Áine through her running the recent Dublin Ladies Mini-Marathon and she was delighted with the support that she received from friends, family and the local community, with donations towards the class at the school. Included in the photo are (L-R) Barry Cuddy, Principal, Denise Sherlock, Áine Treanor, Jenny Stoops and Bernie O'Neill. Members of Truagh Macra na Feirme make a presentation to Le Chéile, which is accepted by school Principal, Barry Cuddy. Truagh Macra managed the activity for the Field Day during the Carrickroe Festival and this money was raised by one of the stalls. Aaron Loughran, Darren Sherlock and Matthew Flood are representing Truagh Macra in the picture. This Macra club was inactive for some time but before last Christmas a few local young people got together to see if there was an interest in getting the Club active again. There was a good response and a committee formed and now there are over 40 members. They organise a wide range of activity and participate in county and national events. There are only four clubs in the County and they meet every month. There has been no activity during the Summer but it will be starting up again in September. It is a terrific organisation and can be a major contributor to personal development as well as fun and enjoyment as well as a very positive and constructive way of spending time. 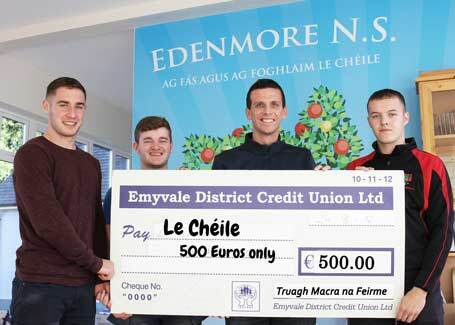 Well done to the Truagh Macra on this presentation to Le Chéile.